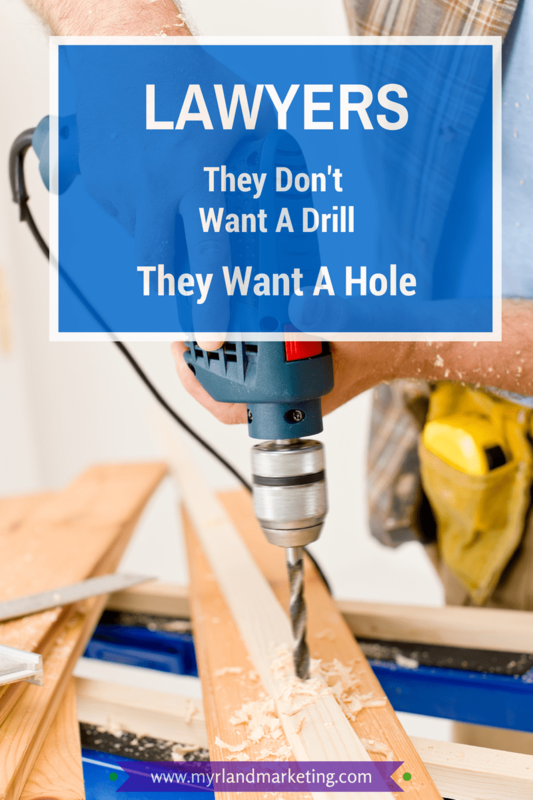 The Myrland Marketing Minute Blog Lawyers, People Don't Want A Drill. They Want A Hole. If you are trying to figure out how to position your practice with your clients and potential clients, they don’t care that you’re a lawyer. They care about what you can do for them. “I’m always telling people to think three or four layers outside your brand. If you’re a plastic surgeon, maybe the discussion stems around body image, healthy lifestyles, and increasing self-esteem. Which seems counter-intuitive perhaps, but you want to speak to the lifestyle concerns of your potential customers and the things they relate to. Just as the people in Amber’s comment above aren’t really shopping for a drill, they are shopping for the relief that drill can provide, meaning the hole. Your potential clients aren’t shopping for a lawyer, they are shopping for someone who can provide a specific solution to a problem, or potential problem. Give this some thought. You’re a lawyer. Got it. But what solutions are you really providing for your clients when they work with you? This doesn’t mean a guarantee of results as you and I know we can’t talk about that, but what end results are they really shopping for when they come looking for you? What is your client’s hole?